When you’re setting up a new home theater, you’ve got some tough decisions to make. Are you going to spend top dollar on a surround sound system, sacrificing convenience and value in the name of sound quality? Or would you prefer to save a few dollars, giving up the expectation of theater grade audio. For many years, this was how it was. Bigger was always better, and better meant more expensive. But sound bars threw a wrench in this system. For the first time, consumers could purchase something compact and affordable, that could keep up with high end home theater speakers in many ways. But there is one way that they always fell behind – special awareness. A 5.1 surround sound system is incredibly adept and producing a sound that your mind can translate into locational data. You don’t just hear a sound; you hear the place it’s coming from. With Dolby’s Atmos 7.1 surround sound system, the speaker marketplace is better than ever. The first consumers to get access to 7.1 systems were those buying component based stereos. But today, Atmos is available in a sound bar. By design, creating a directional sound is one of the areas where sound bars lack the most detail. With this is mind, a sound bar is the last type of device we’d expect to be Atmos enabled. But Sony promises that this unique sound bar is unlike anything else on the market, so we went hands-on to see how it performs. 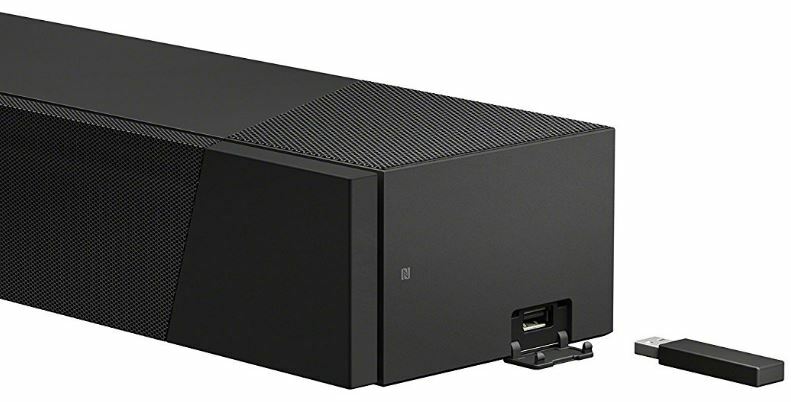 When you first start to explore the specification in detail, you’ll realize that the Sony HT-ST5000 is a lot more fully featured than your standard sound bar. It comes complete with a separate subwoofer, and can handle 7 full-range channels of audio. At 800 watts, you might think that this is the kind of system that could blow the roof off your house. But once you realize that there are really seven separate speakers in one compact package, you’ll realize how it uses so much power. The connectivity options on this sound bar are even more advanced than some of the receivers we’ve reviewed. Since it can process high resolution audio, it requires a digital signal direct from the source. The best way to get this is via pass-through HDMI audio. Sony provides you with three HDMI inputs, all of which are compatible with HDCP 2.2. Whether you’re watching a classic DVD or the latest 4K Blu-Ray, you’ll be able to connect it to the back of this speaker. It then provides a single output to your television. Why have three inputs and one output? Well, in some ways this makes sense. Six ports would require an unreasonable amount of HDMI cords, and by providing one output it’s basically acting as your video switch. 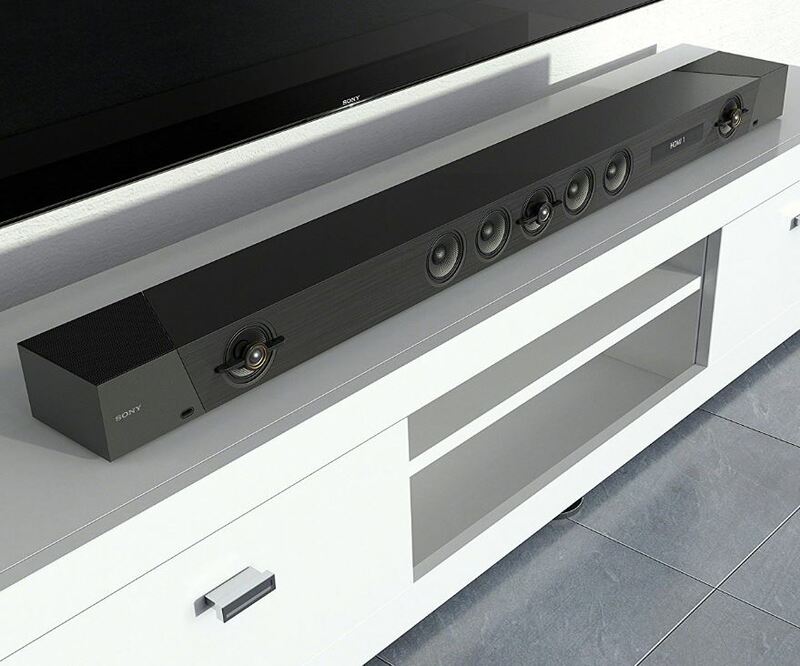 Your TV will always be on the same input, but you can cycle through your video sources via this sound bar. The HT-ST5000 can also receive Bluetooth audio, which is a quick and easy way to get some music going at your next social event. However, this is a pretty high end speaker. Bluetooth isn’t always a lossless connection, so we wouldn’t recommend it for movie buffs who want to take advantage of the surround sound features. 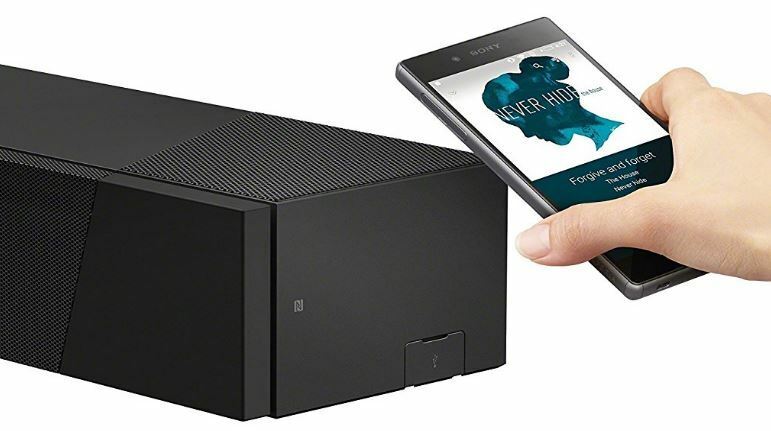 It also supports technologies like Google Home, NFC, and Spotify Connect, so you can sync and control this speaker from any device that supports these features. Last but not least, there is a Chromecast built right in. Anytime you’re streaming wirelessly to your television, the sound bar will be in the loop as well. When you’re getting into high end sound systems, it’s important to be mindful of what formats a receiver can support. You might think that all HDMI audio is the same, but there are actually several file formats that are supported. Currently, this receiver supports FLAC, PCM, WAV, and ALAC. This is most of the lossless audio codecs in use, so there is a pretty good chance that your high-res audio source will work flawlessly. DSD, however, is not currently supported. Although it is listed on the product page, there is no software support for it. Sony promises that a firmware upgrade is coming that will enable DSD support, but at the time of writing it’s not available. Fortunately, DSD isn’t the most widespread codec available. We do look forward to the update coming, but for now it shouldn’t affect your usage too much. Sony didn’t use your average speakers in the HT-ST5000, and this is obvious from the second you turn it on. It’s got seven mid-range drivers, two up-firing drivers, three super tweeters, and a stand alone subwoofer. The end result is a sound that is precise and refined. Clarity is unparalleled, and the performance is powerful and engaging. These are very analytical speakers. Fine details are obvious, and it executes explosive soundtracks with care and caution. It reminds us heavily of what you get in a real theater. But It’s still very different from what you’d get in your standard sound bar. The main difference is the directional speakers. Most sound bars have omnidirectional speakers. For example, Bose Bluetooth Speakers use multiple drivers firing in all directions, which creates a sound that seems too big for the compact enclosure. But this model has speakers that are highly directional. You only hear them if you’re sitting in their line of fire. This means that most of the directional drivers are inaudible until the sound reverberates off of your roof or walls. The end result is something that sounds eerily like a proper surround sound system. We were constantly caught off guard, turning our head towards a sound that seemed to come from either side, when it really was just a high end audio trick. If you were to pair this against a $4000 surround sound system, you’d probably find that the dedicated system was superior. But this model so vastly exceeded our expectations that we’d have trouble pointing out any flaws. Listening to this alone, it really does sound like a true surround sound system. Sony is a well known brand, but they have never been known for incredible build quality. In most cases, their $200 speakers look and feel like a $200 speaker. But this is a different beast. It’s clear that Sony wanted to make a mark on the industry, and make consumers rethink what a sound bar could be. In almost every regard, the design and build quality is exquisite. The texture on the rightmost side of the bar, the precise alignment between the fabric-wrapped portions and the plastic portions, and the gentle embossment around the edge of the sound bar. This isn’t something you look at from a distance and go “wow!” This is something unseemingly luxurious. From a distance, it looks like your everyday, ordinary sound bar. But once you get up close, you start to notice that this is a high end device. We had a hard time finding fault in the HT-ST5000, but we do have a bone to pick with the lack of DTS support. The product description lists it as DTS compatible, and Sony promises that a firmware update is coming. But currently, there is no DTS support. If this is important to you, we wouldn’t recommend buying it until the update comes. Had Sony not listed it as DTS compatible, this wouldn’t have been such an issue for us. But in our eyes, it’s bad business practice to list features that consumers currently can’t benefit from. If you’re tight on space but aren’t willing to compromise on sound quality, Sony’s HT-ST5000 is a fantastic choice. It is, without a doubt, one of the best sounding sound bars we’ve ever tried. Although we were skeptical of the surround sound feature, it turned out to be audibly indistinguishable from a full 7.1 system. Is this going to be the best option for everyone? Not necessarily. This is much more expensive than most sound bars. You’re paying about the same that you would for a dedicated 7.1 system. The difference is that you’re getting something that is much more compact, easier to set up, and more enjoyable to use. For movie fanatics, there is no doubt in our mind that this is a great choice. For music, it still works great as a peripheral system. With stereo audio, you’re not really getting the most of what this system can offer, but it does work. At the moment, this is one of the only products of it’s type available. But we love where the technology is going, and hope that this is the first of many compact 7.1 systems.